This digital era is marked by a lot of technologies – they have become so familiar — so that they are very hard to identify as a single device. More systems have become so complex and are built from the integration of several subsystems. Instrumentation deals with combining subsystems in order to accurately measure, control, or observe a system. An example of such a system is the type that connects a force sensor and a data acquisition (DAQ) device. This type of system – whose objective might be to control or measure certain processes — is developed by connecting several units together. This article discusses the various subsystems of a sensor-DAQ setup and uses some of Tacuna System’s devices to explain some concepts better. To fully understand how the various subsystems are integrated — in connecting a force sensor and a DAQ system – it is important to have a general overview – a block diagram — of the system and the function of each block. 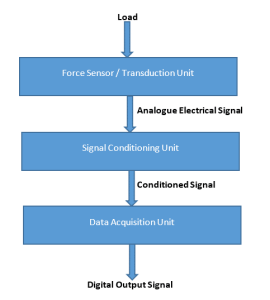 The block diagram in figure 1 below shows the force transduction unit, the signal conditioning unit, and the data acquisition unit. A sensor detects a physical phenomenon — such as force in the case of this article – and transforms the detected quantity into an equivalent output. The output might be pneumatic, mechanical, or electrical –– in the process called electrical transduction. These devices, the force transducers, are built based on some physical principles that allow them to produce electrical signals when a physical force is exerted on them. Hence the various physical principles form the basis on which these devices are classified. Basically, the following are the common types of force sensors: the hydraulic types, the pneumatic types, the capacitive types, and strain gauge types. There are still many other force sensors other the ones listed above. The hydraulic force sensor works on the principle of force-balance, that allows it to use a piston and a fluid contained in a sealed cylinder chamber to perform the measurement. The piston-fluid interface transmits the force exerted on the loading platform to a pressure indicator or a pressure transducer. The pneumatic type also works on the same principle of force-balance but it instead of a fluid, it works with compressed air or gas. The capacitive force sensor uses the relationship between the distance of separation of two charged plates and the capacitance. A plate is made stationary while the other is movable. The force exerted on the moveable plate decreases or increases its distance from the stationary plate, hence producing an output capacitance that is proportional to the applied force. 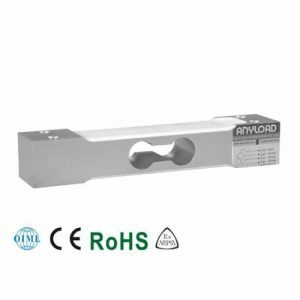 The strain force sensor type also called a strain gauge load cell is the most commonly used among the types listed earlier. This load cell uses an elastic resistive material — called the strain gauge – attached to the structural member of the device, to transform the force into an electrical voltage output. When a force is applied to the load cell’s application point, it is transformed into a strain by the structural members. This strain is then transmitted mechanically to the strain gauge which deforms elastically in order to produce a change in its resistance. This change in resistance is then converted into an electrical voltage by including the strain gauge in a Wheatstone bridge circuit. Therefore, the strain gauge load cell has about four wires: two power supply/excitation wires and two output signal wires. This is the intermediary unit that exists between the transduction unit and the DAQ unit. It performs the work of transforming the output from the transducer unit into a form that is compatible with the data acquisition unit. This signal conditioning process basically involves Isolation, signal filtering, and signal amplification. Consider a case where the force sensor is to be powered through a regulated supply on the signal conditioner circuit, the use of an electrical isolator is necessary. It will isolate the force sensor from a direct connection to the power supply. The advantage of this helps to cater for fault currents. Isolation can be done by a magnetic isolator – e.g. a transformer – or an optical isolator — e.g. an opto-coupler. The signal from the load cell, which has been filtered is routed to the amplifier. It should be noted that this input signal — from the load cell —is very small, in the order of millivolts (mV). This voltage range cannot be passed directly to the DAQ unit, because the DAQ will not be able to detect it, hence no useful work can be done with it. The need for amplifier then arises. The amplifier serves to increase the dynamic range of the sensor output to a level equal to or near the dynamic range of the DAQ. There are about two methods that can be used to transform this low voltage signal into a reasonable level that can be used by the DAQ unit. First, the output terminals from the sensor can be made to be part of a voltage divider circuit; the voltage divider output is then amplified by a differential amplifier. Second, the sensing device can be incorporated into an arm of a Wheatstone bridge – as in the case of a strain gauge load cell – then have its output terminals connected to an amplifier. The widely used amplifier in the industry is the Instrumentation amplifier. Its advantages over the normal differential amplifier include its high and stable gain value, very high input impedance, very low output impedance, and an extremely high common-mode rejection ratio. This is the process of removing unwanted signals – noise – from a signal. This can be implemented by using specially designed circuits – active and passive filters – or by simply placing a bypass capacitor between the positive terminal of the signal path and the ground terminal of the signal path. 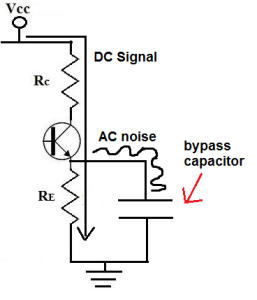 The capacitor will serve as a low pass filter as it will conduct high-frequency signals – AC noise to ground. Filtering is always needed directly before the amplifier and output of the amplifier – the end of the signal conditioning stage. In summary, the power supply to the load sensor is isolated, then the output voltage is passed through a filter placed directly in front of the amplifier stage. 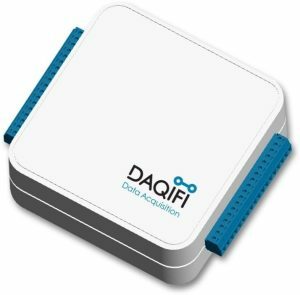 The instrumentation amplifier presents a low input impedance signal source to the DAQ; so that changes in the input of the DAQ do not affect the output from the amplifier. This unit receives the conditioned signal — the conditioned signal – from the force sensor. The major roles of the DAQ subsystem are to perform digital signal processing on the received signal, meaning this subsystem is a digital system. It is basically made up of the following digital signal processing units: The anti-aliasing filter, the sample-hold (S-H) circuit, the quantizer-encoder circuit, and the digital signal processor – analogous to a microprocessor. 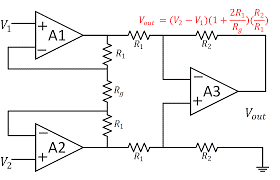 It is the filter circuit that is located directly at the output terminal of the amplifier. This analog filter circuit serves to band limit the input entering the DAQ unit from the amplifier circuit. The band limit is necessary so as to ensure that the input signal frequency components higher than half of the DAQ’s specified sampling frequency is removed. Without the anti-aliasing filter, there would be difficulties in processing or recovering a sampled signal. The sampled signal will contain various overlapping and indistinguishable frequency components. This overlapping effect is called Aliasing. The anti-aliasing filter is built from the unit specifications and mathematical tools – frequency domain tools. This component performs sampling: the acquisition of a continuous signal at discrete time intervals resulting in a sequence of samples. Sampling is done based on the Nyquist Theorem which states: an input analog signal can be accurately reconstructed from its sampled version if it is sampled at a rate that is at least twice its highest frequency component. This shows why an anti-aliasing filter is needed at first since the filter limits the analog signal from the amplifier to a certain bandwidth – lower or equal to half of the sampling rate. 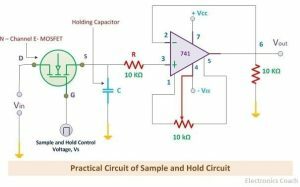 The Sample and Hold circuit (S-H) is then designed to sample the analog signal the sampling rate. The S-H circuit is made up of a solid-state high-frequency switch, a holding capacitor, and a buffer amplifier– a voltage follower. In practice, the S-H circuit is very key to the sampling process because the input analog signal is time-varying. To truly sample this signal, its instantaneous value at each specific time needs to be determined. The circuit holds the instantaneous value steady till the next time interval. The processing of the held signal value has to be performed within that holding time period in order to achieve an accurate result. The figure below shows a simple S-H circuit. This unit, therefore, converts the analog signal into a discrete-time signal – continuous in amplitude but discrete in the time domain. The quantizer unit serves to perform what can be described as sampling in the amplitude domain. 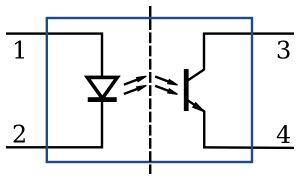 Quantization creates a range of equally spaced levels, where B is the number of bits used in the analog-to-digital converter (ADC). This means that each level exists between only two possible limits, hence the signal is said to have been quantized. The encoder then assigns a certain binary code to each of these levels. The encoder can use either of these two encoding schemes: the two’s complement coding scheme or the offset binary coding scheme. Therefore, the output of the encoder is a digital signal. Please note that the S-H circuit, the quantizer, and the encoder forms the ADC. This is so because the input to the S-H circuit is analog and the output from the encoder is digital. This performs certain processing operations on the digital signal: frequency and time domain analysis, filtering, convolution, and correlation. The DSP is a unit that has its own subsystems. Also, it runs on a dedicated hardware architecture that is quite similar to that of a general microprocessor. 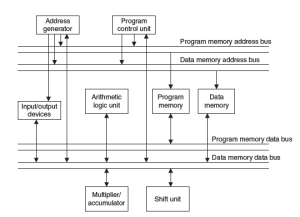 The special hardware unit of the DSP includes multipliers, accumulator unit, shifters, address generators, data memory, and a program memory. The digitized signal is stored on the DSP memory to be retrieved later for processes such as display or process control. The architecture of a DSP is shown below. 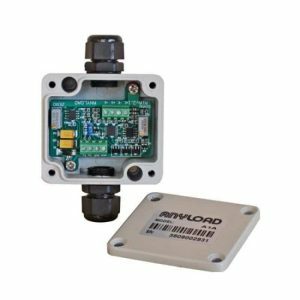 Finally, a telemetry system can be integrated with the DAQ subsystem for the purpose of transmitting the digitized force sensor output accurately over a long distance to a remote location. The detailed block Diagram of the units and subsystems that connects the force sensor and the DAQ is shown in the figure 6 below. The data acquisition hardware shown in the figure below is a portable device that can aggregate input from several sensors. It has multiple input channels through which several sensor units can connect to it. This device also has the capacity to transmit the aggregated data to a central remote location through a wireless network. 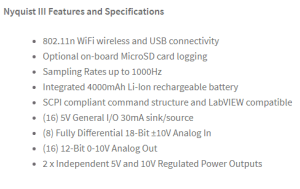 The features and specifications of this device are shown in the figure below. It can be seen that it offers both wired and wireless telemetry systems, it has a data logging system, its sampling rate is 1000Hz, and it has 16 input channels. Also, note that the analog input channels have a dynamic range of 0-5V with a sink/source current of 30mA. This means the sensor connecting to any of the channels on this must have had its output amplified to that dynamic range. Tacuna systems also offer a wide range of amplifiers and conditioners that can then be used to interface a force sensor — such as a strain gauge load cell – to this DAQ hardware. A sample amplifier and its datasheet specifications are shown in the figures below. The datasheet shows the amplifier gain, the load cell type it supports, the input range –- from a sensor—it supports, the output voltage and current. Note that the output voltage and current signal value all fall within the dynamic range of the DAQ device. Hence you have your complete package all ready to be coupled together to get your system up and running in a short period of time.